Priceline and its peers such as Expedia (EXPE) and Orbitz Worldwide (OWW) have been investing in marketing and promotion, technology, and personnel in an attempt to improve long-term operating results, but these expenses have pressured operating margins. Priceline’s management said on the earnings call that “operating margins were impacted by 146 bps of deleverage and offline advertising mainly related to our Booking.com TV campaigns in the U.S. and Australia and the inclusion of KAYAK offline advertising.” Although Priceline has managed to efficiently improve its margins, its peers have struggled. In 2013, Priceline’s total online advertising expense was approximately $1.8 billion, up 41.2% year-over-year. A substantial portion of this was spent internationally through Internet search engines, meta-search and travel research services, and affiliate marketing. The company has worked on building brand awareness for Booking.com, Priceline.com, Agoda.com, KAYAK, and Rentalcars.com via aggressive marketing and promotion campaigns. It said it uses online search engines (primarily Google), meta-search and travel research services, and affiliate marketing as primary means of generating traffic to its websites. It also invested approximately $127.5 million in offline advertising via television, print and radio. Priceline said its online advertising ROIs were down year-over-year for 2013. Its online advertising as a percentage of gross profit has increased due to lower returns on investment (ROIs) from online advertising, brand mix within the group, and channel mix within certain of its brands. Plus, its international brands are generally growing faster than U.S. brands, and usually spend a higher percentage of gross profit on online advertising. Expedia mentioned in its annual filing that its marketing channels include social media sites such as Facebook (FB) and Twitter (TWTR). The marketing initiatives also include promotional offers and traveler loyalty programs such as Welcome Rewards and Expedia Rewards that are recorded under its expenses. Orbitz (OWW) said in its annual filing that its marketing expense increased 16% or $39.5 million to $292 million, due largely to the growth of its private label distribution channel, which increased affiliate commissions by $23.5 million, and search engine and other online marketing of $32.7 million. 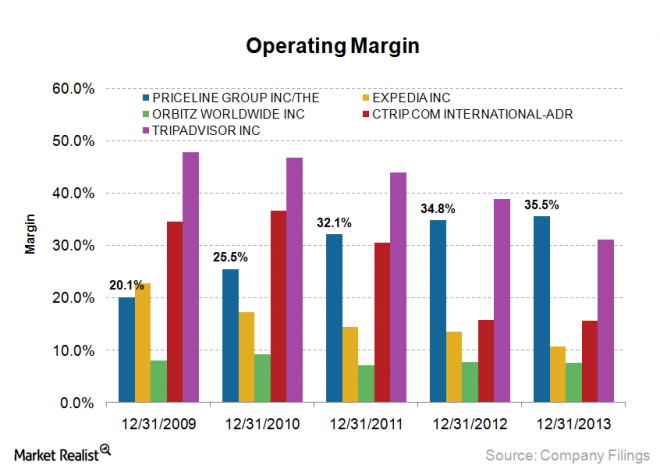 via Why Priceline’s peers are struggling to maintain operating margins » Market Realist. This entry was posted in CMOs in Travel, Destination Marketing, Digital Marketing, Direct Marketing, Travel agents and tagged Expedia, Google, Kayak, Orbitz, Orbitz Worldwide, Priceline, Priceline.com, TripAdvisor by Jemma Neethling. Bookmark the permalink.